The Ibizan Hound, also known as the Podenco Ibicenco, Ibizan Warren Hound, Ibizan Podenco and Ca Eivissenc originated in Eivissa, one of the Balearic Islands. The Ibizan Hound, while very similar to the Pharaoh Hound, can be distinguished by it's larger size and coat color. The breed was primarily utilized in areas such as Spain and France for hunting small game, mainly rabbits. The Ibizan Hound's ability to hunt in any terrain using their excellent speed, sight and hearing made them ideal hunters for local farmers. It was not uncommon for an Ibizan Hound to hunt for his master and then go back to hunt for himself, as these animals were not fed by their owners. When the hunters took the Ibizan Hound out to hunt, their pack would consist mainly of females with only one or two males, as the female was revered as the better hunter. There is a good deal of controversy regarding whether or not the Ibizan Hound can be listed among the ancient dog breeds. Drawings on the walls of ancient tombs led experts to believe through striking similarity that the Ibizan Hound was in fact quite ancient, however, recent DNA tests do not support this theory. Some experts say though, that with better tools, it is very likely that the Ibizan Hound could be traced back thousands of years. The Ibizan Hound will typically reach heights of 22-29 inches and an average weight of 42-55 pounds. The Ibizan Hound is seen in three different variations. 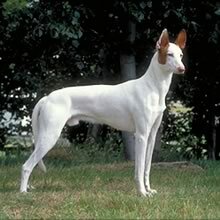 The smooth-haired Ibizan Hound is the most common and exhibits short, fine hairs. The wire-haired Ibizan Hound is less common, and will feel much softer to the touch than the short-haired variety. The third variation of the Ibizan Hound is the long-haired variety. There is question as to whether the extremely rare long-haired Ibizan Hound truly exists, or if it is merely a variation of the wire-haired coat. The Ibizan Hound will always be seen in a combination red and white coat. The Ibizan Hound is a very energetic and intelligent breed. They are known for their ability to learn and have been known to easily outsmart cages and baby gates. The Ibizan Hound is also very athletic and resourceful making them excellent escape artists. A very high fence is recommended if you own an Ibizan Hound, as they have the ability to jump to great heights from a still position. The Ibizan Hound is a very prey driven breed, and so should never be left unsupervised with small animals or let off the leash in an unenclosed area. The Ibizan Hound is a very energetic and intelligent breed. They are known for their ability to learn and have been known to easily outsmart cages and baby gates. The Ibizan Hound is also very athletic and resourceful making them excellent escape artists. A very high fence is recommended if you own an Ibizan Hound, as they have the ability to jump to great heights from a still position. The Ibizan Hound is a very prey driven breed, and so should never be left unsupervised with small animals or let off the leash in an unenclosed area. The Ibizan Hound is a very loving and comical breed. They greatly enjoy clowning around for the entertainment of their family and are known to get along well with children. The Ibizan Hound is very attached to their family and will prefer to be with them as much as possible. Due to this the Ibizan Hound is not recommended for kennel living. They are also quite protective of their family and will be suspicious of any stranger until it has been made clear that they mean no harm. The Ibizan Hound will do well with other dogs as well as cats as long as they are raised together from a young age. The addition of a new adult dog should be handled by taking the two animals on a “Pack Walk”, allowing both dogs to understand that you, the pack master, are in charge. While the Ibizan Hound will likely love the family cat that it was raised with, they will likely chase and even kill a cat it doesn't know, so they must be kept under close supervision. You can find Ibizan Hound puppies priced from $1500 USD to $1500 USD with one of our credible breeders. Browse through our breeder's listings and find your perfect puppy at the perfect price. The Ibizan Hound is a very loving and comical breed. They greatly enjoy clowning around for the entertainment of their family and are known to get along well with children. The Ibizan Hound is very attached to their family and will prefer to be with them as much as possible. Due to this the Ibizan Hound is not recommended for kennel living. They are also quite protective of their family and will be suspicious of any stranger until it has been made clear that they mean no harm. The Ibizan Hound will do well with other dogs as well as cats as long as they are raised together from a young age. The addition of a new adult dog should be handled by taking the two animals on a “Pack Walk”, allowing both dogs to understand that you, the pack master, are in charge. While the Ibizan Hound will likely love the family cat that it was raised with, they will likely chase and even kill a cat it doesn't know, so they must be kept under close supervision. No variety of the Ibizan Hound requires an extensive amount of grooming. The occasional brushing will suffice. Be sure to keep your Ibizan Hound's ears clean and nails trimmed. The Ibizan Hound is a quick learner, and is eager to do so. However, a meek or timid pack master breeds a stubborn and willful Ibizan Hound. Be sure to exert your authority as pack master during training to ensure the dog knows his place in the pack. Although they are willing to adapt to their living situation, Ibizan Hounds need a great deal of exercise. Outdoor activities where they can run freely will keep them content. They have a strong hunting instinct, so be sure to keep your Ibizan Hound on the leash at all times. Ibizan Hound Puppies for Sale - Shipped Worldwide! Finding the right Ibizan Hound puppy can be dog gone hard work. PuppyFind® provides a convenient and efficient means of selecting and purchasing the perfect Ibizan Hound puppy (or Ibizan Hound puppies) from the comfort of your home, 24 hours a day, 7 days a week. Take advantage of our PuppySearch or leisurely browse our directory of hundreds of dog breeds, Ibizan Hound dog breeders, Ibizan Hound dogs for adoption, and Ibizan Hound puppy for sale listings with photos and detailed descriptions. Some Ibizan Hound puppies for sale may be shipped Worldwide and include crate and veterinarian checkup. Many Ibizan Hound dog breeders with puppies for sale also offer a health guarantee. With thousands of Ibizan Hound puppies for sale and hundreds of Ibizan Hound dog breeders, you're sure to find the perfect Ibizan Hound puppy.